Who is his next quarry? Bounty hunter 4-LOM stands in the sands of Tattooine. High-quality, limited edition, hand-painted, 1:8 scale statue. Can Zuckuss be far behind? 4-LOM stands in the sands of Tattooine, searching for his next bounty… but who is his quarry? 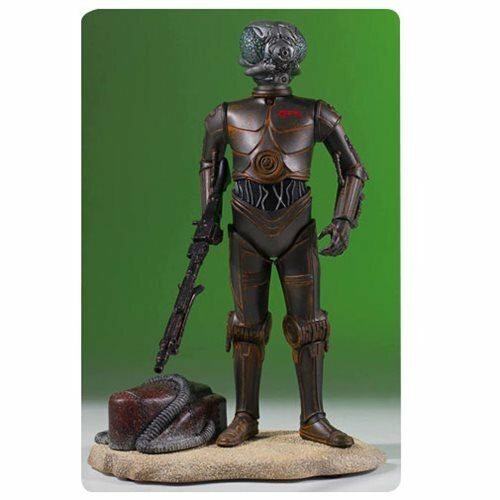 4-LOM is the fourth statue in the 1:8 scale Bounty Hunter Collector's Gallery line, celebrating over 40 years of the Star Wars universe. Each limited edition, hand-painted piece is cast in high-quality polyresin with crisp details. The Star Wars 4-LOM Collector's Gallery Statue also comes individually numbered with a matching certificate of authenticity. 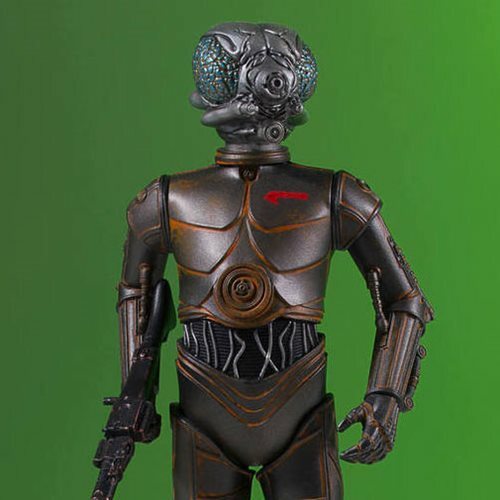 A rusty droid with insect-like features was originally a protocol droid, but logic glitches in his systems allowed him to escape and forgo his original programming to become a fearsome bounty hunter. 4-LOM was paired with Gand Findsman Zuckuss to find Han Solo and the Millennium Falcon, but they were beaten to their prey by fellow bounty hunter Boba Fett.